I had never painted a seascape work before, but I was so taken with this photograph I had snapped with the beautiful sapphire and turquoise ocean while on holiday at Tura Beach, NSW, that I just had to have a go. There were many frustrating times throughout the whole process, many trials and mistakes along the way, but in the end I feel I have achieved what I wanted to capture. 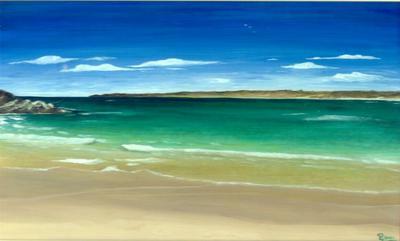 Although this was my first seascape many years ago (and definitely not my last) it is my favourite one! I really like your painting, it definitely captures the feeling, good work.